Johvanny Torres knows firsthand what it’s like to be a single parent struggling to balance classes and kids. So the Marine Corps veteran and president of Tidewater Community College’s Computers for Student Success program had an inspired idea. Give the gift of Chrome. Or rather Chromebooks to a deserving student population. 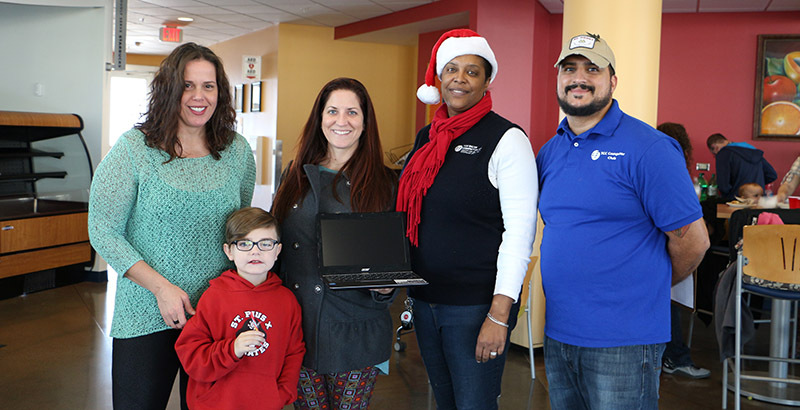 He got plenty of buy-in from TCC’s Center for Military and Veterans Education and the college’s computer club, which awarded 55 refurbished Chromebooks in holiday gift boxes to military-related students and single mothers. The recipients of the Chromebooks had to be taking courses at TCC full time. They were selected through a need-based application process; many were nominated by professors and classmates. Nansemond-Suffolk Academy donated the computers. Stacey Ennabe, who is pursuing a Certificate in Welding at TCC’s Portsmouth Campus, said the gift will allow her to spend more time with her children. “It will make it a lot easier to get smaller assignments done. I won’t have to take extra time to go to the library while my kids are home,” she said. Nikki Thornton, a mother of two pursuing a Career Studies Certificate in Cyber Security, said the Chromebook will help tremendously with her on-the-go schedule. “This gift is really going to help me complete my work when I’m not at home – especially when I’m at after-school activities for my kids,” Thornton said. For Joanne Madinger, the Chromebook giveaway couldn’t have come at a better time for her and her family. Since its inception in 2009, Computers for Student Success has provided more than 10,000 computers to deserving students and nonprofit organizations. Program volunteers repair close to 1,500 computers per year at club headquarters on the Virginia Beach Campus.